Offset umbrellas also known as cantilevered umbrellas or side post umbrellas are the choice for most people who prefer to have a versatile solution when dining, enjoying their spa or simply want a little extra shade under a canopy without a table and center pole sticking out of the table. These are free standing umbrellas that utilize a weighted base and can typically extend far beyond the reach of an ordinary patio umbrella. 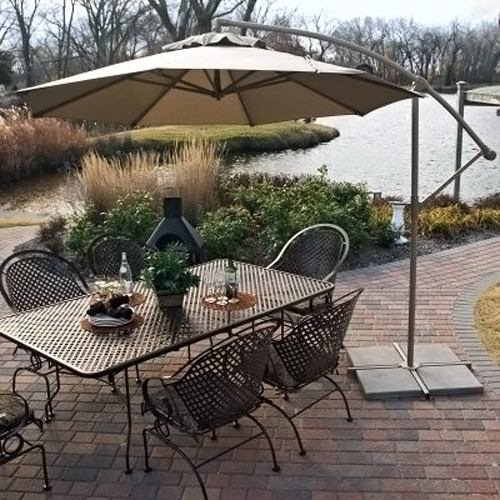 One other preferred feature is that this type of umbrella works quite well for any type of table whether it has a center hole or not plus the cantilevered design allows you to follow the sun and provide for 360 degrees of shade throughout the day.